Rising Japanese star Saori Ishioka will return to competition at Jewels: “Sixth Ring” on December 11th and faces yet another difficult task when she meets reigning Freestyle Cage Fighting Women’s 125-Pound Champion “Slick” Sally Krumdiack in a featured bout. Ishioka is coming off of a tough loss to #1-ranked female Megumi “Mega Megu” Fujii in July, but had won six of her previous seven fights and will look to get back on the winning track when she takes on Krumdiack, who just picked up the biggest win of her career. Ishioka (7-4-0) has been a staple of Jewels events since the promotion shed its former “Smackgirl” moniker in November of 2008. 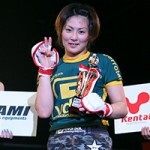 She has won two of her three fights inside a Jewels ring, with the lone defeat coming via second-round armbar against Fujii. Having already taken on tough challengers such as current Valkyrie contender Mei “V Hajime” Yamaguchi, Jewels postergirl Mika Nagano and highly-touted Seo Hee Ham of South Korea, Ishioka is no stranger to adversity. Krumdiack (7-2-0) has also battled elite-level competition in her short career, including #2-ranked female Tara LaRosa. Though she was defeated by LaRosa, Krumdiack made it well into the third round and put on a solid showing. Her only other loss to date came in a 2006 bout with undefeated flyweight star Jessica Pene. Having just captured the Freestyle Cage Fighting Women’s 125-Pound Championship with a three-round decision win over Nicdali “The Night Queen” Calanoc, Krumdiack will drop down to 115 pounds for the fight with Ishioka. While Japanese promotions – especially those featuring female fighters – are notorious for bringing in foreign competitors to lose to local stars, Krumdiack has the tools to spoil the party for Ishioka and could very easily pull off a victory. Both Ishioka and Krumdiack have won each of their seven victories in exactly the same fashion – one by TKO, two by submission and four by decision – and both are well-rounded fighters. While they do not have any glaring weaknesses, both have struggled in the past when fighting off of their backs and neither possess devastating knockout power. The fight is a very interesting matchup between two fighters with similar styles and it will likely come down to which one is best able to implement their game plan. Krumdiack would no doubt love to make an instant name for herself in Japan by knocking off one of the country’s rising stars. Jewels: “Sixth Ring” takes place on December 11th.